Axor Starck Organic scores highly in bathroom planning in a number of different ways: technical innovations and sustainability result in unique design and versatility in a wide variety of ambiences. Customers are increasingly appreciating these qualities. We support planners throughout the process. Pre-adjustment of the temperature to suit personal taste means less hot water when mixing, which in turn means less energy consumption. The separate temperature control also helps to conserve resources when only cold water is required: in this case, the pre-adjustment setting maintains its position without affecting the temperature control. Resource-conserving usage of material: the innovative hollow-body construction of Axor Starck Organic means about a third less brass in comparison to conventional designs, and thus less energy consumption in the production. 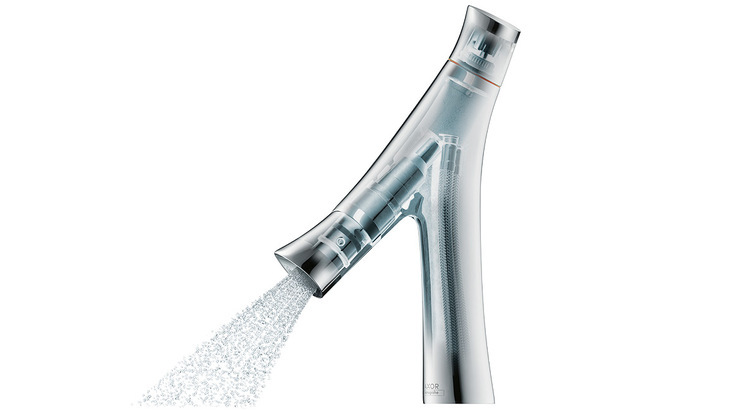 Axor Starck Organic boasts significantly lower water consumption than conventional mixers. In its normal position, the mixer shower jet provides full functionality at a maximum 3.5 litres/minute. Gradual water quantity control is also possible up to this flow rate. If you require more water, just twist the spout of the basin mixer to the “Booster” position, at 5 litres/minute. Decoupled water-conducting unit: The water-conducting unit is separated from the mixer body, so drinking water is kept free of any possible lead or nickel interference. A great solution for planners who need to act in response to certain conditions or accommodate specific customer requirements.